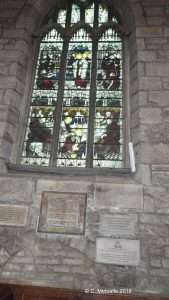 There are 3 artefacts connected with Lieutenant-General Sir George MacMunn, in St Swithun’s church. On the north wall (left as you face the altar) there are 2 tablets in memory of him and of his wife. 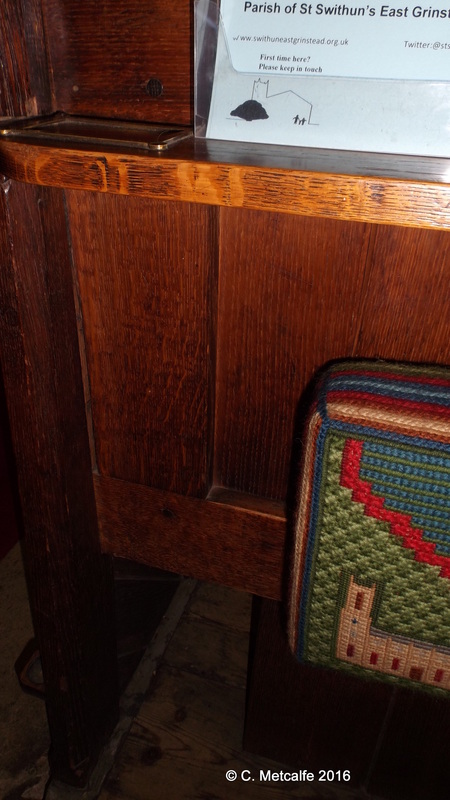 The third is pew with a panel removed, where he used to sit. 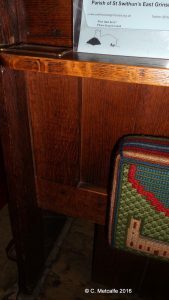 The panel was apparently taken out to accommodate MacMunn’s stiff leg. 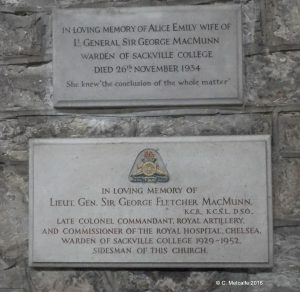 Lieutenant General Sir George Fletcher MacMunn. KCB, KCSL, DSO, was a British General, scholar, and was the Warden of Sackville College, East Grinstead, from 1929 until his death in 1952. He was born in Chelsea on 14 August 1869, and died on 23 August 1952. He married Alice Emily Watson, and they had a son and a daughter. Alice predeceased her husband by 18 years. He entered the Royal Military Academy at Woolwich as a 2nd Lieutenant in 1888 and was a Major-General by 1917. He served in Upper Burma, South Africa, India, with the Mediterranean Expeditionary Force and with the Mesopotamian Expeditionary Force. For his services in the Great War at the Dardanelles and in Mesopotamia, he was mentioned in despatches 10 times. 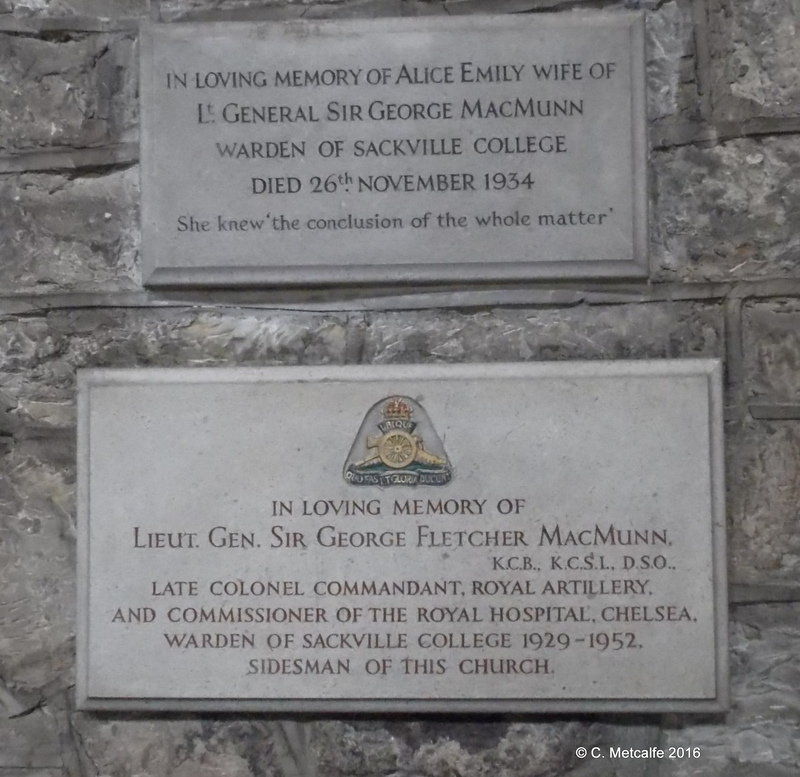 He retired in 1925 and became Colonel Commandant of the Royal Artillery, 1927-39, and Commissioner of The Royal Hospital, Chelsea, 1932-38, and Warden of Sackville College from 1929-52. Whilst at Sackville College, he served with the Home Guard, 1940-42. He wrote articles and novels on military and historical themes, and was a founder of the (Rudyard) Kipling Society and served as its Honorary Treasurer for a number of years. Perhaps this passage had a special resonance for Sir George and Lady MacMunn. His own plaque lists some of his roles and has the emblem of the Royal Artillery. 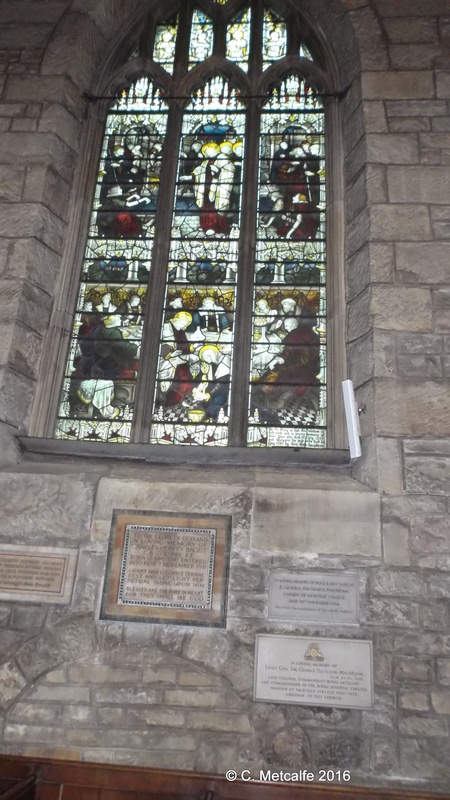 It states that he was a sidesman at St Swithun’s church. MacMunn was clearly a very important figure in his day. It is important to record what we can of his life, whilst there are still members of the congregation who can remember him.